Miguel Andujar darted and weaved like an N.F.L. running back, trying to avoid the inevitable as his teammates closed in around him in shallow right field. Andujar had just vanquished Cody Allen, the superb closer for the Cleveland Indians, with a base hit, and his fellow Yankees wanted to shower him with celebratory hugs and a lot of Gatorade. Andujar’s ninth-inning single off Allen delivered a 7-6 Yankees win and ended a wild game in which the Yankees’ bullpen surrendered two leads and squandered a terrific pitching performance by C. C. Sabathia. His hit scored Giancarlo Stanton, who led off the ninth with a double and moved to third base on a groundout by Aaron Hicks. That brought Andujar to the plate against a closer who helped lead the Indians to the 2016 World Series, and who went into the game with a 1.98 earned run average. The win was the 13th in the last 14 games for the Yankees, who kept pace with the Boston Red Sox to remain a game behind them in the American League East. But for some, that is not good enough. “Everyone in here knows we can get better,” Sabathia said. The game featured a three-run home run by another rookie, Gleyber Torres, who connected off Cleveland starter Josh Tomlin. It was Torres’s first major league home run, a memorable milestone to go along with his .333 batting average in his first 13 games. “He doesn’t play like a rookie,” Yankees Manager Aaron Boone said. Gary Sanchez and Aaron Judge also hit home runs that helped stake Sabathia to a 5-0 lead. Sabathia appeared headed for his third win of the season. He pitched six scoreless innings, allowed three scattered hits and struck out seven to lower his earned run average to 1.39. That superb performance affirmed the praise that Boone, now his manager but also a former teammate, showered him with before and after the game. Boone, who played with Sabathia in Cleveland in 2005 and 2006, said that during their time there he developed a healthy respect for the big left-hander. A dozen years later, that respect has blossomed. That is where Sabathia went after the sixth inning. Dellin Betances pitched a scoreless seventh to temporarily protect the 5-0 lead, but then things went haywire for the home team. 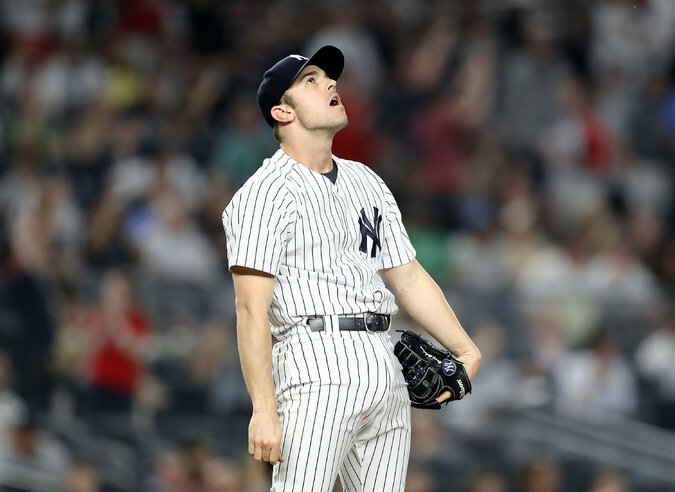 The Yankee relievers, who had pitched with precision and guile during the team’s recent winning stretch, came unglued. Chasen Shreve was next out of the bullpen and surrendered a three-run home run to Bradley Zimmer, Cleveland’s No. 9 hitter, without recording an out. As Zimmer rounded the bases, with Yan Gomes and Rajai Davis jogging ahead of him, many fans booed. The jeers would grow even louder when Francisco Lindor followed with a single. Boone did not seem to like what he saw, either, and replaced Shreve with David Robertson, a more seasoned and reliable pitcher. But two batters later, Robertson surrendered a two-run home to Jose Ramirez that evened the score, 5-5. 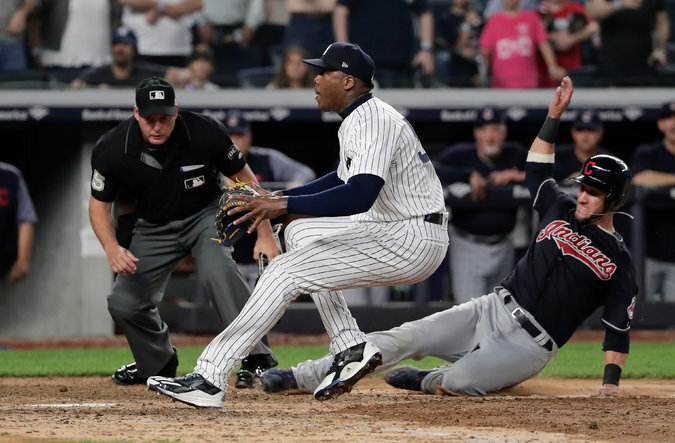 The Yankees took the lead again in the eighth when Judge drew a two-out, bases-loaded walk, but Aroldis Chapman’s wildness, and a communication problem with Sanchez, the catcher, allowed Cleveland to tie it again. Chapman surrendered a leadoff single to Gomes in the ninth and then hit Zimmer with a pitch. He threw a wild pitch that allowed both runners to advance, and then another high fastball eluded Sanchez, who was apparently expecting a different pitch in a different location. “They got crossed up,” Boone said. Gomes scored to make the score 6-6. But in the bottom of the ninth, Stanton and Andujar made it all O.K.